The Sarasota real estate market tends to be a cyclical one. It picks up and slows down in concert with the influx and exodus of our seasonal residents and tourists. Our market might be most easily divided into thirds: high season, typically January, February, and March; low season, October through the holidays plus April & May; and off-season, the rest of the year. As we tiptoe into the cooler, most enjoyable months of being a Floridian, we are already noticing a massive pick-up in the local housing market. *All the data below is comparing October 2017 to September 2017. 50% increase in pending sales. 50% more properties went to contract in the month of October over September. Welcome to selling season. 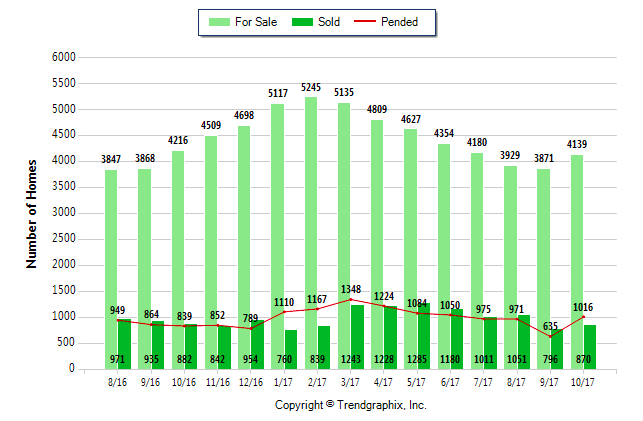 This means there are active buyers beginning to flood our market, and more importantly, it means our market has bounced back in a big way from the stranglehold that Irma put on us for a couple weeks in September. 11% increase in sold properties. Not only did more homes go to contract in October than September, but more sets of keys changed hands too. 7% increase in properties for sale. As you can see from the bell curve in the graph above, people list their property in direct correlation to the seasonal & tourist nature of Sarasota. More people in town = more people looking at your home. 8% increase in sale price. Single family homes in Sarasota County sold for an average of $382,000 in October. The condominium market showed a 5% increase, with a mean price of $379,000. 0% change in a couple key areas. The list price to sale price ratio remains at a very typical 93%. This means that in general, you can expect to sell your home for approximately 93% of what you originally list it for. The Sarasota County market generally hovers in the 92-96% range. Also without change from last month to this is the number of days on market. This is how long a home is listed prior to going under contract. For both September and October, that number is 76 days. Again, this is pretty typical, as our market over the last year ranged from monthly averages of 66-82 days. Is now the time for you to sell? We can help you make that decision. We can look at your specific building or neighborhood and provide you with the most up-to-date market information so that you are making the best decision. Fill out a contact form here if you would us to assist you in selling your home or condo. We are always here to help you! Older PostJust Sold: New at The VUE!